“I can’t remember that I ever didn’t sing"
In the fast music World Tina Turner is as vibrant as her music: strong, full of charisma and unbreakable. We have a talk with her about why she does what she does and why she has so much success. In this afternoon in August the summer is practically gone. The wind blows the waves of the Zürich lake to the shore. The uncrowned Queen of Rock and Roll lives at the shore of the Zürich lake. The elegant brown-black Limousine is ready for the photoshoot as well as Audi Boss Ernesto Larghi, a photographer and an assistant. The only thing that is missing is the sun. Until Tina Turner suddenly appears. It is as if she has jumped from one of her albumcovers: with sparkling eyes, her wild hair, that is kept in place by a gummi bond and her red lips in a smile. Every thought about the autumn is gone. Elegantly she walks over the gravel with her long legs, that are the most beautiful in the Rock history, in black trousers with high heels. “Let’s do it", she says and takes a certain pose. As if time didn’t touch her. 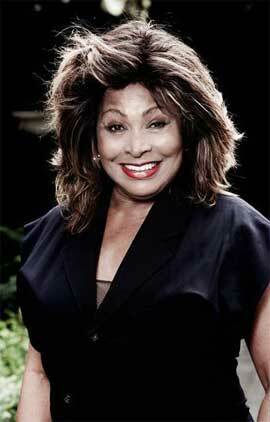 Audi Magazine: Tina Turner, 5 times you said that you were going into retirement. Every time you returned to the stage. Do concerts keep you young? TT: Performing on stage keeps me healthy and fit. A tour is really a workout. But that wasn’t the reason that I came back. The last tour happened because a lot of fans wanted me to go back on stage. Like a thank you to me. Nowadays I only perform in a little circle. I don’t want the responsability for a big tour with a band anymore. I love being retired, being at home and the fact that I don’t have to fly from one city to the next anymore. Audi Magazine: You don’t like to travel? TT: I don’t like to fly. At the airport they always take photos from me and I have to give out autographs. And sometimes I don’t feel like doing that. And then you have the checkpoints. It is stress. Nowadays it is best to wear your clothes on your arm and after the security control you put them on. So when it is possible I like to travel by car. I have my private space then. It is my extended home, so to speak. Audi Magazine: What is important in a car, so that you feel at home in it? TT: First of all it has to look good! I want the wheels and the headlights to look good. The inside of the car isn’t that important for me. There are too many buttons I think. I think Audi has a good interior, with its four wheel drive. When we drove from Paris to Nizza we got a lot of snow. I never experienced it like that. The windshield wipers couldn’t handle it. I got nervous, but the four wheel drive coped great. I realised that only lorry’s and us were on the road. It convinced me, that a car not only has to look good on the outside, but has to be good inside too. Audi Magazine: Do you remember your first car? TT: Yes of course! It was a grey Chevrolet with a black roof. A good first car. After that I drove a golden Cadillac Eldorado with a brown roof. And after that a Jaguar, for 2 people. I fetched that myself at the dealer. It had 12 cylinder and when I drove home under the sunset I felt really free. That sounds a bit like kitsch but it was a wonderful feeling. Tina Turner laughs her famous laugh and throws her head backwards. The 70 year old Diva mesmerises her audience with her charismatic charm. Every story she tells is entertaining. Her voice fills the whole room, she is a good storyteller and uses a lot of arm gestures. The woman that was born as a poor girl from the south of America and made it to the best artist from all time was born to be onstage. Audi Magazine: Tina Turner, when did you start singing? TT: I don’t know exactly. I can’t remember, that I ever didn’t sing. When I was young I already was the leadsinger of the church choir. In Nashville, where my parents lived during the war, the seller from the store sometimes gave me some money when I sang. I collected them all in a nice box of glass. It was as if even then I knew that I would earn my money with singing. Audi Magazine: When you were a little girl did you see yourself as a concert singer? TT: No. In the south there was no entertainment industry as in the north. You only had the church, sometimes a picknick and the radio. I didn’t know anything about stages and concerts. When I went to St.Louis with my elder sister Alline I got familiar with the Club life. And when I heard Ike Turner for the first time I knew that performance is everything. When I performed on stage for the first time, I felt so good. Audi Magazine: You sold more concerttickets than any other star. Why were you better than the rest? TT: You need a lot of endurance, an enormous willpower and a dream. And that from the start. I always had a goal: I wanted a nice home for myself and the ones I loved. I wanted to look good and to feel good. And I knew that I couldn’t have it all at once. But I kept that dream. Audi Magazine: And the enormous willpower? TT: As a woman in fact you always need that. After I broke up with Ike I realised that I had been controlled by the male ego. To break free from that I had to discover myself again. As a solo singer I learned that it is important to first conquer the women. After that you have the whole public. This has made me very strong. I had to earn a living. To fullfill my family duties. And my dream. She has fullfilled her dream. With her home at the Zürich lake. Her partner Erwin Bach is part of that, the visits of her sons. And watching the Zürich Lake turn into a living painting. Meditation. The woman that was on the road for so long, wants peace and quietness now. She says she has found that in Buddhism. And in Switzerland. And when she longs for another place she listens to music. Audi Magazine: To what kind of music do you like to listen? TT: That depends on my environment. When I am at home I like New Age music. In my car I have to get in the mood for music. I like listening to Pink Floyd, The Rolling Stones, Dido and of course Robbie Williams. I also like Rihanna, but her text is a bit too tacky. And I also like Enrique Iglesias, but only sometimes. Audi Magazine: And how about Tina Turner? TT: I never listen to my own music. My own music is for all work. When you have learned songs and tried them out and after that you toured with them for a whole year, you don’t want to listen to them anymore. Don’t get me wrong. I am very proud, when my songs are on the radio. I still think they are good and not oldfashioned, but I like to listen to other music.